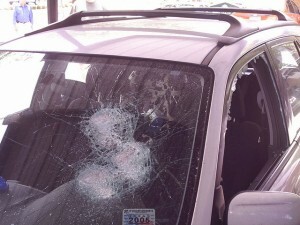 Poll: Has your vehicle ever been vandalized/stolen while caving? Has you ever come back to your vehicle after a caving trip to find that it’s been vandalized or stolen while you were away? This weeks question was unfortunately prompted by the complete destruction of both the front and rear windows of our ride while on a caving trip this past weekend. Answer the poll and tell us your stories in the comments section. Let’s hope that “no” wins handily. Has your vehicle ever been vandalized/stolen while caving? Last week we asked readers if they’ve ever used their caving skills in other situations. In an unexpected result, most folks answered that they had. Reader Ian Chechet mentioned his ability to following barely discernible trails that he honed while caving and caver Bill Reed commented on his experiences entering holes that guys one third his size refused to. Poll: How many caving events will you attend this year? Poll: Are trip reports written after each time you go caving? My vehicle has never been vandalised when caving, but we did come out of a cave one time to find five emergency vehicles parked next to our car, Apparently, our vehicle was parked in such a manner that an area resident had reported the car as an accident. Agency personnel had spent the last 30 minutes looking for the missing driver. When we informed the agency personnel that it was our car, we were fine, and that we had just been caving, their response was “In what cave?” Our response was “That cave,” and we pointed to a cave less than 100 feet away and visible from the road.